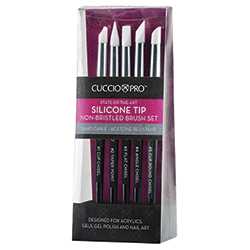 Non-bristled brush set that performs better than traditional bristle brushes. Designed for acrylics, gels, gel polish, and nail art. Alcohol and acetone resistant. 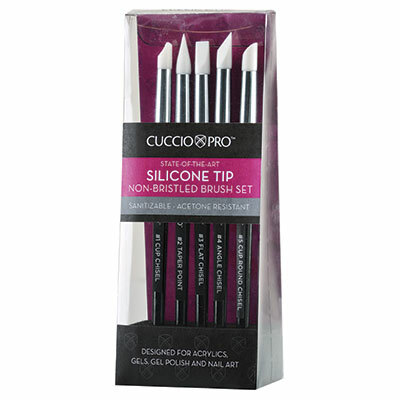 Includes: Cup Chisel Brush - Remove polish, create negative space, and adjust contours/edges, Taper Point Brush - Create clean smile lines and circular edges, Flat Chisel Brush - Create detail and blend polish and gels, Angle Chisel Brush - Make precise marks and lines, Cup Round Chisel Brush - Perfect for nail art application and controlling thick gels.